The parallax scrolling effect may not be to everyone’s taste but I think it works very well in the Cafe Pro theme and helps to make pictures of menu items really stand out. The rest of the design is really nice too. The Typography is great and overall, the theme feels easy to use. Cafe Pro has a one page layout with the main sections of the site including the about us section and the menu being part of the homepage single page layout. Whilst this should be fine for small cafes or restaurants, if you have a large menu or a detailed about us page where you really want to show people as much detail as possible, separate pages would probably be better. The other thing lacking in the Cafe Pro theme is a booking facility. Whilst this would be fine for small cafes who would probably not need this feature, anyone thinking about using this theme for an establishment that requires booking should be aware that you would need to integrate a separate booking facility, possibly with the use of a plugin such as OpenTable. One of the major advantages of buying Cafe Pro is the fact that the Genesis Framework comes with the theme. Genesis is a great framework that provides a rock solid foundation for any WordPress website and gives you the advantage of having thoroughly tested, secure code and automatic updates. 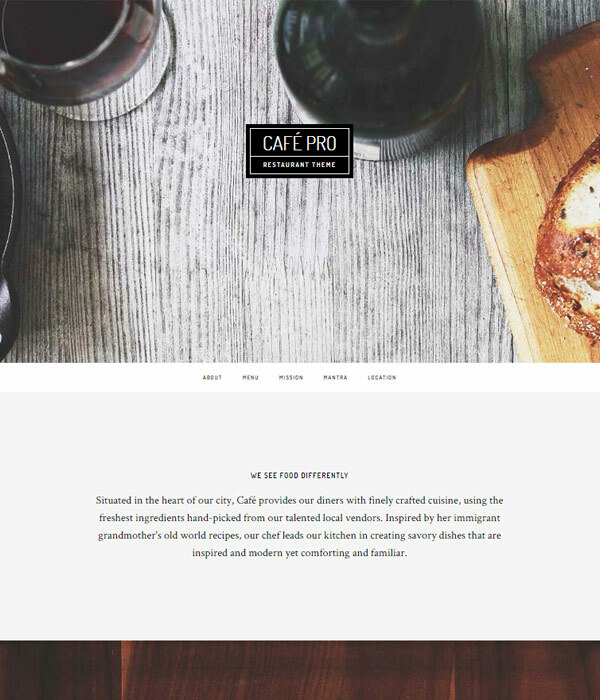 Overall, Cafe Pro is an ideal theme for small Cafes and restaurants who want a simple web presence and have no need for booking functionality out of the box.